Darryl “D.M.C.” Matthews McDaniels is an American musician. He is one of the pioneers of hip hop culture and founding members of the hip hop group Run–D.M.C. In 2010 Darryl heard about VIAM; and sent us the following message. ” The most valuable resource on this earth is our children, and the most valuable thing to a child is to have a home! All children are our responsibility and must be given every opportunity to have access to everything needed for them to become the great people they already are! And this is not about flesh and blood! It’s bigger than that! These children have an assignment and it’s our assignment to assist them on there life’s journey, and the nurturing ground; the fertile soil is a home! That’s what every child deserves! That’s the difference between life and death for them. We can not allow any child to be deprived of “a place called home!” And it’s up to us to get these kids where they are supposed to go…just like me! Just like Byford and Bannah McDaniels did for me …Good Luck with Voice in a Million. “ – Darryl McDaniels, Run DMC. 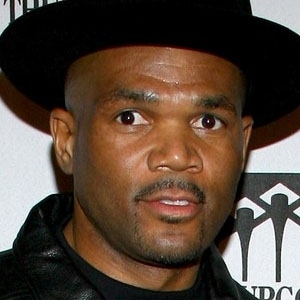 In 1997, hip hop legend Darryl McDaniels should have been riding high. Run-DMC was touring Europe after a remix put them back atop the charts, and money was rolling in. Instead DMC found himself alone in a hotel room, contemplating suicide. Coping with vocal troubles and creative differences with his group, he found no joy in the spoils of the rap game. Poison, a bullet, a giant leap were all options he considered. As he now recalls it, it was a song by Sarah McLachlan, “Angel,” that brought him back from the edge. “Fly away from here, from this cold hotel room,” she sang. “There’s vultures and thieves at your back and the storm keeps on twisting.” The sadness in her voice captured an emptiness D felt but could not explain – until a few years later. In gathering information for his autobiography in 2000, 35-year-old D got a bombshell from the only mother he’s ever known – she told him he was adopted. The revelation left him stunned and confused. Amid that emotional turmoil one thing became clear: Darryl wanted answers about his true history. In 2006, Darryl Received the ‘Angels in Adoption’ award.